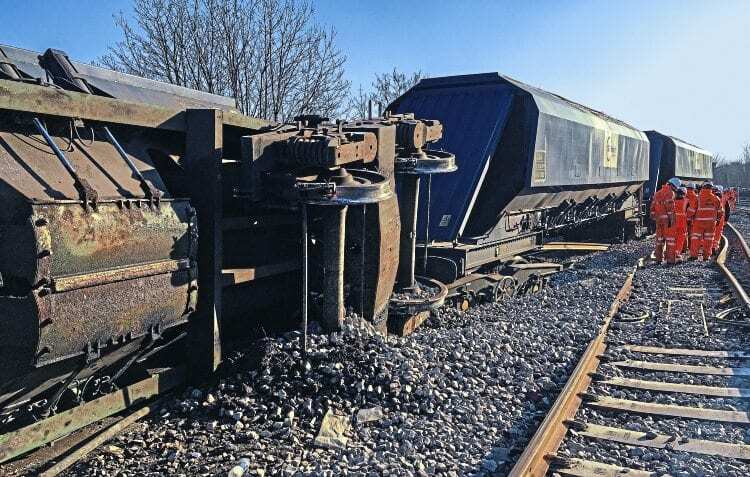 On January 24, two of the wagons of the 6M90/03.56 Grain to Neasden loaded GB Railfreight sand train derailed at Courthill Loop Junction South in Lewisham (South London) while crossing from the Up Slow to the Up Courthill lines, resulting in all running lines being blocked. Three of the GBRf JGAs at the rear of the train were detached from the rest with the rear wagon staying on the track. The middle hopper, No. JGA ERG 17302 (seen on the right of this picture) was derailed but remained upright, while the other vehicle turned on its side tipping 30 tonnes of sand onto the track.